This is our family diary, of sorts. I am WAJ, married to RW, and we have 4 children, named here by first initials. H, our oldest 9yo daughter, RT, 7yo son, and our younger daughters A, 5yo, and B, 2yo. We live in the burbs of the PNW. I've finally read a few anti-fear books on health that have freed me from my short lived 'whole food living' kick and gotten me back to my old, carefree ways. That's great, because I was having some problems with the changes these books required to be 'healthy'. Call me lazy, but I am not going to research the soil content where my produce was grown. I think of my grandmother, who lived a great life to the ripe old age of 92...and I'm pretty sure she never baked her own bread...with or without organic whole wheat flour! It doesn't matter how many blueberries you add to plain yogurt...it's still gross. So, back to my old ways: Eat, Drink, Be Merry...in moderation. Another fun Easter Brunch at the H family's home. Cold, cloudy, and rainy...yes, but still fun. The Easter bunny had come the night before and left tons of candy and squirt guns! The baskets were by the back door, and we occasionally get those little sugar ants coming in that door through some tiny crack. So RTH came down to find ants swarming on his 'peeps chicks', but somehow that did not deter him from digging through the ants in the basket and scarfing down as much candy as possible before breakfast. Yeah, it's very likely he swallowed a few ants. At least they don't cause cavities. After church, friends and neighbors came for food and our annual egg hunt. Each year as all the kids get older there is less crying, screaming, and fighting over eggs. In fact, there was none this year! Plus, no one stuffed themselves to the point of throwing up chocolate...that is a big feat. ANH is the only little 5yo (now 6!) I know who successfully managed to give up chocolate without cheating for 40 days. Even she didn't gorge herself on it when she finally could. Happy Easter! We are proud owners of the SNUGGIE (with complimentary reading lamp). It is so big it can fit all 3 girls. For some reason the boys have no interest. When I fist got it, RWH said I looked like Grim Reaper Smurf. I found out it is a rip-off of the Slanket, but Slanket didn't have the ad with the Snuggie-ensconsed family cheering at the ball game. Baseball season is fast approaching. I think we will need 5 more orders. RTH can wear his when he's on the bench. If you don't think it's cool....well, you must not have seen the infomercial yet. It's The Blanket With Sleeves. I recently read a book from the library entitled In Defense of Food by Michael Pollan. I'm not what you'd call a 'foodie'...far from it. The H family eats pretty well, we like our fruits and veggies, but we're no strangers to corn dogs, root beer, and Honeycomb. This book interested me because it talks all about the history behind the 'Western Diet'...and how it is making us sick and fat. At the same time, it slams the science of 'nutritionism' and helps to explain why we are supposedly learning all about what we're supposed to be eating yet getting sicker and fatter. I loved this book because it explains something I've often wondered every time I read how much of each nutrient I'm lacking. I wonder, what about those 100 year old people living poorly yet happily in villages all over the world...how can they do it when they're not getting their daily allowance of dairy and omega 3s?? How come Eskimos can live so well on whale meat alone....you know they're not getting enough grains. Another aspect of nutrition that has bothered me and is addressed in the book is the 'long term studies' of who ate what for how many years and why they're better than us now....can anyone really keep an accurate tally of their vegetables for 10 years? C'mon. Though I still recommend it, the down side to the book is now I'm all whole grains this and organic that. Store bought bread is poison..and the hydrogenated oil peanut butter, corn syrup jelly, and corn syrup plus chemicals fake whole wheat bread our son RTH has been eating every day for 6 years is basically poison. So, I've been making a conscious effort to have us all eating a lot better. We all want our kids to be healthy and smart, right? I mean, the good food is supposed to help your brain as much as your body. I thought I had been doing well until said son came down for his morning 6 bowls of cereal-which is healthy now! Yes, he can eat almost as many bowls of cereal in one sitting as my brother could back in the day. So, he came down stairs and asked, "Mom, can I please have some Flakes Bran?" A few funnies from church. Today I decided to take the younger girls to the Ash Wednesday service at our church..this is the first time I've ever gone, but it was a nice service. Ok, gloomy, yes, but thought-provoking. It's a somber, quiet service. There weren't a whole lot of people there and definitely no kids besides my 3 and 5yos. They sitting quietly while the vicar discussed the meaning of the ashes.... and matters of life, death, love, and faith, when my littlest one calls out, "I NEED TO GO POOP!!" Then it's time to get our ashes put on our foreheads in the sign of the cross. We are in a slow-moving, solemn line at the alter when little BBH sees the first lady get a black smudge on her forehead and says, (again, very loudly) "I DON'T WANT THAT ON MY HEAD!!" ANH (5) was simply disappointed because she wanted her smudge to be darker. Do I think they got some meaning out of the service? Um, maybe. But I was glad I went. Last week, they attended a Christian youth group which they go to a few times a month called GHG. I picked them up afterwards and all seemed well. The next day, ANH says out of the blue-"Mom, at GHG they said that if someone hits us on the cheek, we're supposed to turn the other cheek..(long pause)..but what if they hit the OTHER cheek??" Then she said, "I've been thinking about that a lot." That had been troubling her little mind all day! Since I'm a great mom who always has just the right answer...I did what came naturally. Burst out into uncontrolled fits of laughter and finally told her, through tears from laughing, "That is a great question!" I'm finally getting back to my blog! Sorry for the long delay..I know I've inconvienenced millions of readers who've been eagerly awaiting what's new with the H family. So I'm here to catch everybody up! My first blog of 2009 is a goodbye to a true, semi-trustworthy, old friend. After 10 years of good service, we are saying goodbye to our 1992 Volkswagon Jetta. 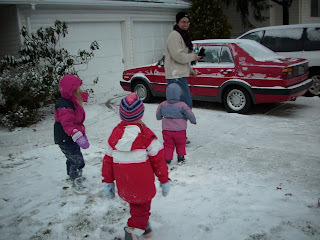 This was our first car here in the PNW, the only car we owned for our first three years of 'real' life (as in, not student life). We found our first home driving this car, we drove to R's first day on the job in this car, we drove to the hospital in this car and came home with our first baby...and our second baby...before we succumbed to the mini van. Another constant was the leaking water problem-remember, RAINY climate. So whenever R would take some people out to lunch from work, the car may or may not STINK..depending if there is standing water in the trunk...which depends if it's rained recently, and, of course, it has. That's just to name a few problems. Now the engine has officially died, so we are donating it to a worthy charity who, for whatever reason, wants it. This is one of the last pictures we have of the Jetta. We are here, playing the glorious Snowstorm of 2008, while the poor clunker is getting it's engine frozen...for good. Even better than a dime....a Norwegian ore, which is like the Norwegian penny. It looks like a dime but smaller. I guess A's piggy bank may need to be supplemented with some coins of value when she realizes the only thing an ore is good for is not choking her sister to death. A parental bail out plan is on the table. The Coin passed yesterday at 9am without incident. Child and Coin are doing well. I am the soccer mom next door and now business owner of Allsports Commemoratives! When we're not working or watching our kids' teams, my husband and I love running!